To achieve the science goals outlined in section 2, NIRPS must meet a suite of top-level requirements. The spectrograph will operate in the Y, J and H bands with a continuous coverage from 0.98 to 1.8 microns. It will ensure high-RV precision and high spectral fidelity at the level corresponding to 1 m/s in less than 30 min for an M3 star with H=9. Its spectral resolution will be 100 000 to best exploit the spectral content. It will be operated simultaneously with HARPS without degrading the HARPS performance. The first light is planned for 2019, considering the timeline for space missions such as JWST and TESS. These requirements flow into the sub-system requirements. NIRPS requiers a continuous wavelength range between 0.98μm (set by FeH feature at 0.99μm) and the red end of H-band at 1.80μm. The instrument’s domain could be extended to K at a later time. K-band contain high fraction of the RV content of the near-IR wavelength domain (~33% in the case of the Barnard’s star), an extension to K band will be very important for the efficiency of a RV monitoring. Furthermore, the extension to K band is desirable for atmospheric characterization of exoplanets, but one must keep in mind that the most prominent feature within that band is the 2.29-2.34μm CO bandhead. Extension to the K band is only worthwhile if it extends to at least to 2.34μm with a goal of 2.4μm. Engineering solutions that lead to small wavelength gaps through the domain are acceptable, but a number of scientifically interesting lines should be preserved as much as possible. Similarly, parts of the near-infrared domain can be removed without affecting the science output of the instrument as they are strongly affected by water absorption from the Earth’s atmosphere. Optimization of the instrument performances should be done assuming the spectral energy distribution of a mid-M star. High-RV precision and high spectral fidelity at a level corresponding to the 1m/s over short and long time scales (years), in order to execute coherent and long-lasting programs. The instrument should be calibrated in wavelength down to <1 m/s over its complete lifetime. Goal: calibrations should not be required more often than every 24h as not to impact science observations. There is no explicit requirement for an interleaved calibration, provided that the <1 m/s stability is met. First light in 2019, full science operation by early-2020. Schedule is a top requirement considering the timeline for missions such as JWST and TESS. Reach a photon noise of 1 m/s in <30min for an M3 with H=9. Fully resolve telluric absorption lines (R>100 000) with a 3-pixel sampling. One should use as a nominal resolution the FWHM of the collapsed 1-D profile of the fiber not its diameter. For a circular fiber, this corresponds to ~0.75 of the fiber’s diameter. The instrument should have a bright limit sufficient to observe stars as bright as τ Ceti (H=1.7, requirement). The goal should be to observe stars as bright as α Centuari A (H=- 1.3). These G and K dwarfs are not within the prime science of NIRPS but the near-infrared coverage is expected to significantly improve the current HARPS sensitivities for these targets. NIRPS should be used simultaneously with HARPS. The dual operation of the two instruments will provide information on wavelength-dependent jitter and activity indicators. HARPS should be used simultaneously with NIRPS for all measurements regardless of spectral type (goal). We note that the acquisition with HARPS may be challenging on the very latest targets, but simultaneous HARPS measurement will provide activity monitoring. 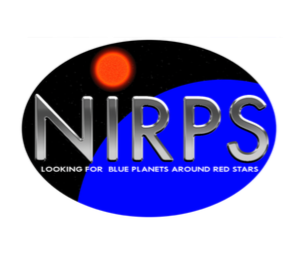 HARPS must be used simultaneously with NIRPS for all stars earlier than M4 (requirement) It is desirable (goal) to use HARPS-pol simultaneously with NIRPS. Overheads excluding telescope slew. Goal should be <1 minute. The on-sky diameter of the fiber should be smaller than 1.2” (requirement). There is no lower limit on the fiber size as long as overall throughput requirements are met. Early discussions regarding NIRPS considered an optional K-band spectropolarimetric mode, it was recognized that preserving the capability for such a future upgrade added significant complexity to the frond-end. We therefore do not required that this option be explicitly preserved in the NIRPS front-end design.